I was initially drawn to ROYAL STREET because of its unique setting: New Orleans around Hurricane Katrina. It's such a bold choice, particularly since it didn't happen all that long ago, and I was really intrigued. I'm pleased to report that Suzanne Johnson has created a marvellous world with an exciting mythology, a tight plot, and engaging characters, and she portrays New Orleans in a magnificent light. DJ, our lovely protagonist, lives in a New Orleans filled with trouble, magic, bad weather, and the historical undead. Wizards, led by a Congress of Elders, keep the peace in the magical world, with sentinels stationed across the world. Wizards come in different colours - literally - since they're categorized according to their abilities. Green Congress wizards are the geeks, using potions and rituals, Red Congress wizards wield pure power, and Yellow Congress wizards specialize in mental magic. (I'm sure there are other colours but these are the ones that popped up in ROYAL STREET.) DJ is a junior sentinel and a Green wizard so she's not exactly perceived as a threat; her mentor, Gerry, is a Red wizard and the main sentinel of New Orleans. The Congress also employs enforcers, which is where our hero comes in. After Gerry goes missing during the Katrina aftermath, Alex gets sent to New Orleans to help DJ with her investigation and her regular sentinel duties. He also happens to be smouldering and gorgeous and bossy, which gives DJ some trouble. Wizards aren't the only non-humans running around town, though. There are "pretes" like vampires, fae, weres, and elves, though they don't all show up in ROYAL STREET. There are also the historical undead, which just may be my favourite part of the world building in this series. They're kind of like ghosts but their strength is based on how well known they are, i.e. the more famous they are, the stronger they are. The book opens with DJ dealing with Jean Lafitte, pirate extraordinaire, but he's not the only historical figure to make an appearance. I'm not going to say who else shows up, though, because it'll ruin the surprise but I think you'll be pleased -- I know I was! DJ is a great heroine. She's plucky and smart and sticks by her proverbial guns. (And only the proverbial ones because she's not so good with the real thing.) I really appreciated how devoted she is to Gerry and to figuring out what happened to him, no matter what the personal ramifications might be. Alex is a strong foil for her. He's more experienced with fieldwork and he has local connections, in the shape of Jake, a cousin who runs a bar in town and who also happens to be interested in DJ. Fun times! If that's not enough, ROYAL STREET also has a nice, tight plot. DJ's investigation goes in unexpected directions and the author has inserted some lovely moments in between the action sequences and investigational developments. She's also turned ROYAL STREET into something of a love letter to New Orleans, which I quite enjoyed. Suzanne Johnson is a native of New Orleans and it really shows. 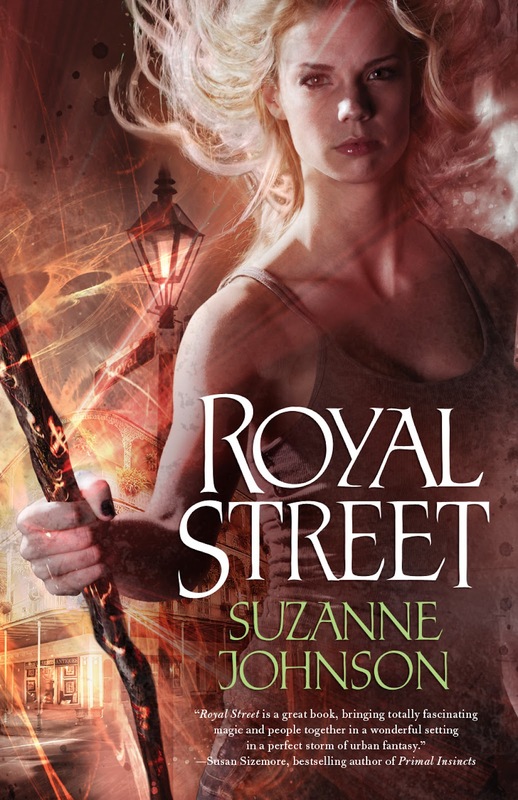 Before I sign off, I'd like to say how much I love ROYAL STREET's cover. It perfectly captures the vibe of the story and it features lots of nice details, like DJ's staff and the New Orleans architecture. All in all, Suzanne Johnson has created a wonderful world in ROYAL STREET, her engaging and vivid debut. It's a great new entry into the urban fantasy genre and I'd suggest you all run out and buy your copies now! 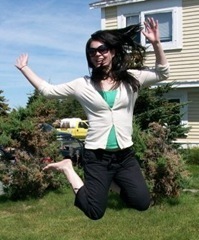 And if that's not enough, you can find two free stories on the author's website! I've been looking forward to this one, glad it got a good review from you! So glad you enjoyed this one soo! I really do want to get into this series one of these days. :) Thank you! I enjoyed this book very much, and after getting over the opening scene read it in a single sitting.